If you mentioned the Kentucky Derby to me a few years ago, I probably would have just shrugged and said “you mean the thing with the crazy hats?” Now that I have actually worked at events where the word “hats” takes on new meaning and I have learned more about horses (Florida is pretty big on horses), I was pretty excited for this year’s Kentucky Derby. Pretty much everyone in good ‘ol Naples has a Derby party, so I decided to honor the day with a little celebration too! So my Dad, who was in town visiting, Nick and I did a little cooking, which included some tasty tilapia that we cooked in aluminum foil packets on the grill, some incredible empanadas (which I’ll be blogging about in the future) and for the grand finale… cupcakes! 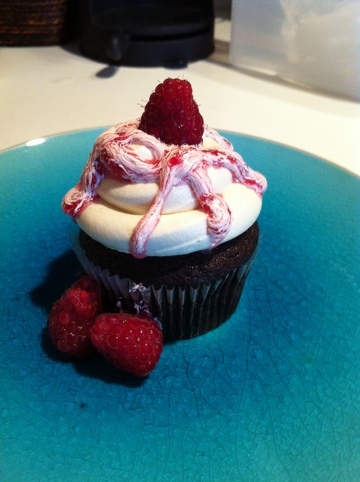 Another delicious recipe from Oh She Glows, the Vegan Chocolate Cupcakes with Almond “Buttercream” Frosting and a Raspberry Drizzle/Glaze. I am most proud of these because they came out not only tasting delicious, but they looked so fantastic. 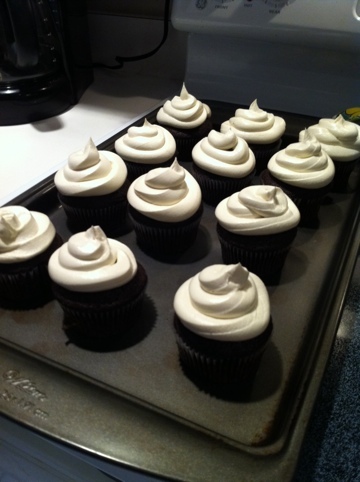 I did make some minor modifications in the frosting recipe – mainly I doubled the recipe and then cut out 1.5 cups of the icing/powdered sugar – and then bypassed the use of pastry bags and settled for a handy plastic bag which I cut the tip off of to get that… fancy, piles of frosting look. 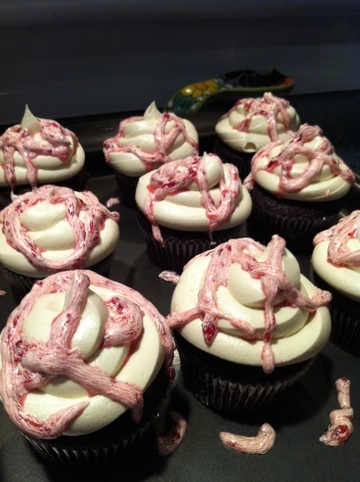 Then a little raspberry drizzle and voila! Even my roommate, who I usually can’t even tempt with a fresh-out-of-the-oven cookie, indulged. I mean, just look at them… could you resist? I nicknamed them the Pants on Fire Cupcake for Derby Day since I was rooting for said horse. Even though Pants on Fire didn’t win, I couldn’t pass on a great name like that and the race was the most exciting 2.5 minutes in sports. I’m already starting to plan for next year’s Derby Day. Did you host a Derby Party?